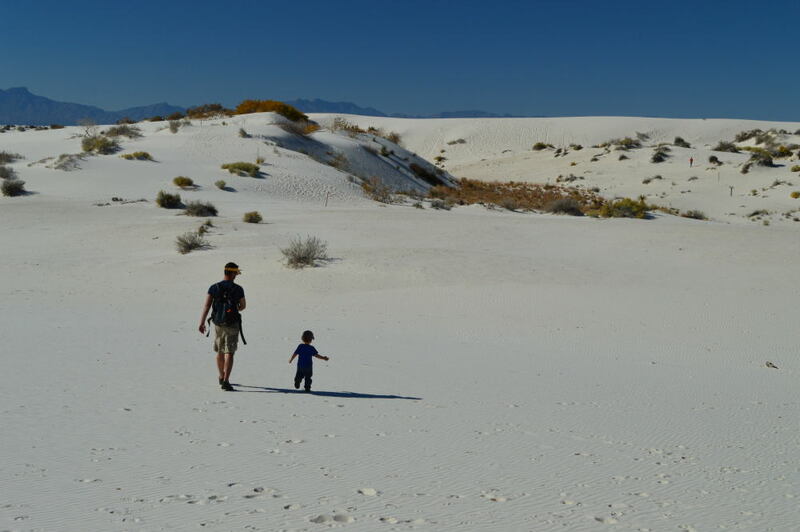 Truth be told, White Sands was one of the places I was most looking forward to visiting when we came up with this crazy idea to travel so extensively with a two-year old. Although we were not able to camp in the monument, our visit did not disappoint. I was so looking forward to camping on the white sand, but the monument only has limited back country camping. We were a little puzzled as to why we were not able to camp there. Once we arrived, it all made much more sense. I guess the Federal Government prefers that family campers don’t set up camp in the middle of an active missile range. I knew that the monument was near a missile range, but I did not realize that it was smack dab in the middle of the missile range. In fact, the monument and the main highway leading to it had been closed earlier in the week when testing activities were being conducted. My understanding is that this can be a weekly occurrence. Lucky for us, the only activity we were caught in the middle of was yet another immigration checkpoint, well inside the borders of our country. We were waved through once we told them we were on our way to White Sands, but we couldn’t help but think of all the folks doing exactly what we were doing who would have to stop and answer many more questions simply because of the color of their skin. Our first stop at White Sands was the visitor’s center. Van ran in with his passport in hand, eager to collect yet another stamp. I picked up his junior ranger’s packet and off we went, ready to explore the park for the day. We all had a great time running around the surprisingly cool sand. Unlike the Great Sand Dunes in Colorado, this sand is made of gypsum and is very cool to the touch. Bare feet for the win! The best part of the day was watching Van examine all the crystalline-like sand structures and spotting tracks of various small critters. Our long and fun day at White Sands was capped off with our very last night of tent camping on the trip. We drove to nearby Alamogordo and slept at a local campground, but given the low evening temperatures (it had been dipping into the 20s), we decided to finish out our stay in New Mexico at rustic cabins, local motels, and two lovely nights at the home of friends in Albuquerque. Though it was sad to pack up our tent and realize that it would be staying in the car for the foreseeable future (and has since been replaced), sleeping in the relative warmth of an uninsulated cabin was heaven. There are many things we enjoyed on our trip over this past year. Second only to visiting with friends and family was spending so many glorious uninterrupted hours, days, weeks in our national parks. If you live near a national park (and most of you do), I encourage you all to go and explore our heritage and history at these fantastic institutions. For added incentive, National Park Week is coming up from April 19th to 27th. In celebration, parks are offering FREE admission on April 19th and 20th. While not all parks charge admission, if a park you’ve been thinking of visiting does, this is the perfect time to check it out. Also, April 26th is National Junior Ranger Day. We’ll definitely have to do something with Van to celebrate. Maybe we’ll bust out all eight of his junior ranger badges (he just earned his eighth at the Springfield, MA Armory). In celebration of all things outdoors and free, KOA is offering a free night of camping on Saturday, May 10th if you stay on Friday, May 9th. Funds raised during that weekend will support KOA Care Camps, which allow children with cancer and their siblings to attend special summer camps around the country. Win, Win! Even if you’re not up for a visit to a national park or camping, I hope you are all enjoying some time in the fresh air and sun. Nothing heals better than an afternoon frolic through the woods. What seems like ages ago now, we rolled into New Mexico after our week in Arizona. We took a circuitous route, heading southeast from Tucson instead of east. We drove through Tombstone, opting not to stop in the overly touristy town, and instead headed further south to the arty (and super cute) mining town of Bisbee and the border town, Douglas. We passed numerous Border Patrol vehicles and one checkpoint for cars heading the other direction a fair distance from the border. 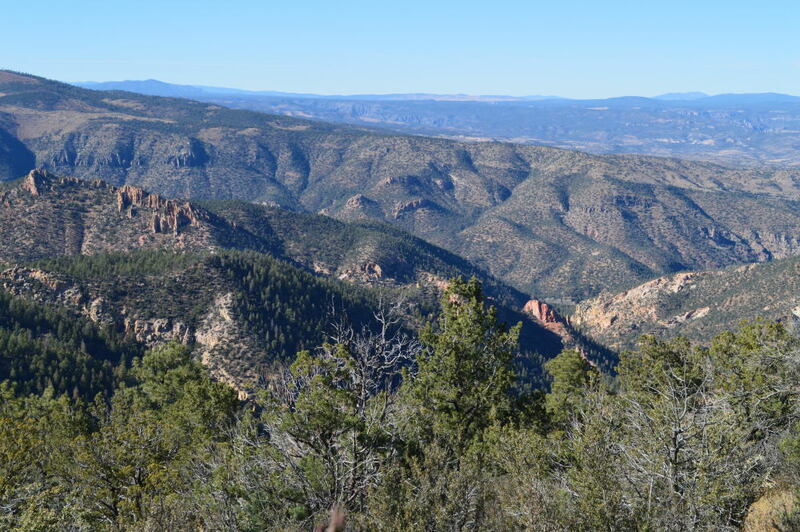 The highlight of our route was the gorgeous western scenery we drove through when we took much smaller roads northeast from the border towards New Mexico. We were one of the only non-pick-ups on the road, over half of which were marked Border Patrol vehicles. To say there was surveillance going on would be an understatement. In addition to the numerous trucks out on patrol, there were a number of small buttes that we passed on which a truck was parked next to portable surveillance equipment. The area was beautiful, but we could never escape the feeling of being watched at all times, even when there were no homes, cars, or people for miles around. Our first stop in New Mexico was in Silver City. This was one of the places I was most looking forward to, and it didn’t disappoint. We kicked off our New Mexico culinary tour with some of the best sauces ever (red and green enchilada sauce and red and green chile sauce) at The Jalisco Cafe. We weren’t sure which sauces we wanted, so they brought us generous cups of each of the four sauces to enjoy. We were in heaven! Besides getting our feet wet with some New Mexican cuisine and chatting up a fellow camper with a homemade camper trailer rigged up on a flatbed trailer with blue tarps, pvc pipe, a heater, and a tv, we spent a day each at Gila Cliff Dwellings and City of Rocks State Park. 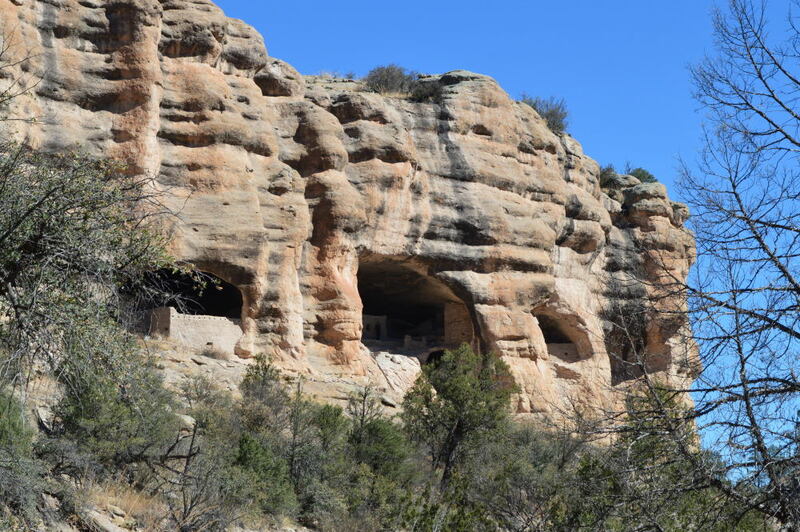 The drive from Silver City to Gila (pronounced Hee-La) Cliff Dwellings National Park is best done during daylight in mild weather. It’s narrow and windy with crazy gorgeous views of mountain forests. One of the most magnificent roads we traveled, it reminded us of being back in southern Colorado, which given its location, shouldn’t be all that surprising. Once we arrived at Gila Cliff Dwellings, we were treated to a stunning hike through a canyon to reach the legendary dwellings. The scent of water was in the air and leafy trees provided shade. We hadn’t experienced this in quite a while! When we reached the dwellings, we joined in on a tour that was being filmed for training purposes. 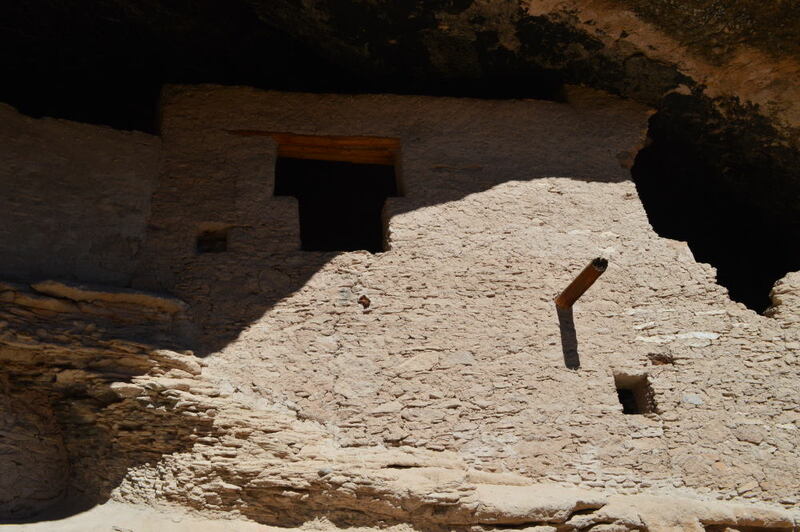 Now future park rangers and volunteers can see our shining faces peering into the cliff-side homes. 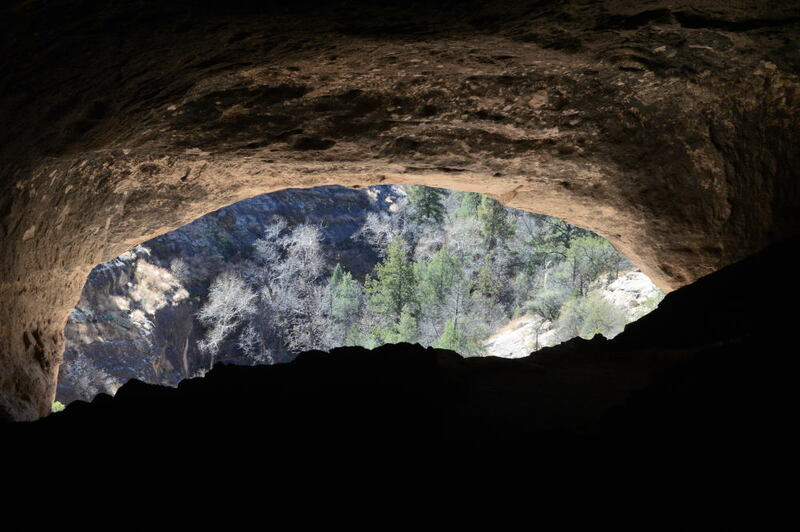 Notice the soot-darkened roof of the cave, blackened from decades of fires from the ancient inhabitants. 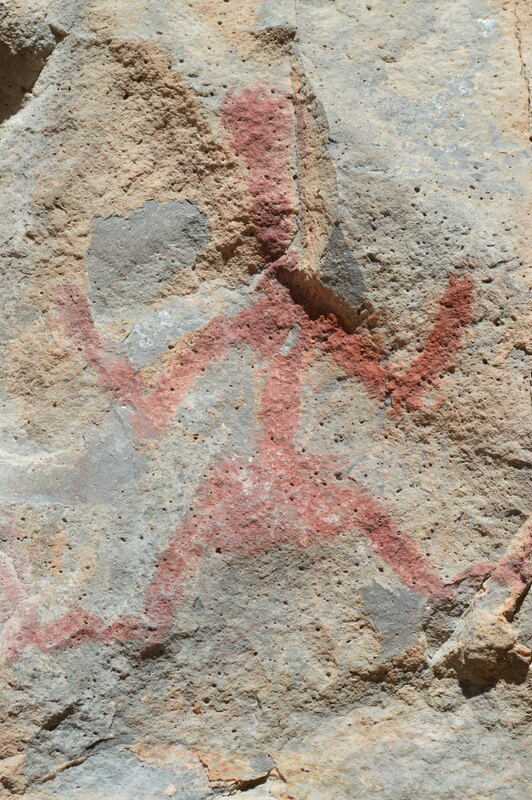 We were also able to spy a number of dramatic petroglyphs and pictographs in the main dwellings as well as in other areas of the park. 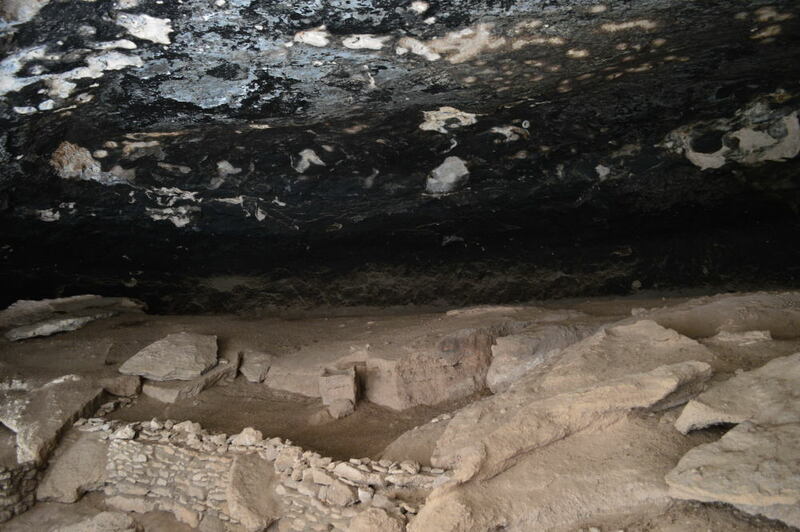 The homes, like many other ancient sites, had been the target of looting and damage in the past. The park service has done quite a bit to shore up the structures, even rebuilding a few before that was frowned upon. There are now very sensible rules in place to help ensure that visitors don’t further damage the structures. We were disappointed to see a couple of long-distance backpackers balk at the rules and speak condescendingly to a park ranger, but I reminded myself that it was the first time we’d seen such disrespect on our trip. And we were extra nice to the ranger to try to make up for the difficult visitors that came after us. While we were visiting the park, all three of us worked on ranger packets. Van worked on his special junior ranger packet geared towards pre-schoolers (the first park we’ve visited that had curriculum specifically geared to this age group) and Alan and I worked on a senior ranger packet (also the first park we visited that had this sort of curriculum). We were really impressed with the program and were happy to walk away with an enhanced understanding of the park along with patches, and a badge for Van, that certified our achievement. 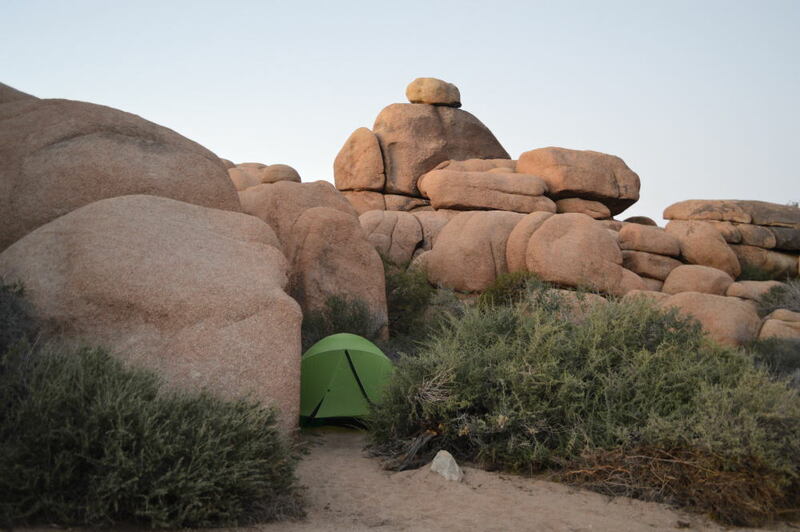 After a chilly night in the tent, we spent the next day clambering around the boulders in City of Rocks State Park. The landscape we drove through to reach the park provided no clue that anything like this would even exist in the area. But then, out of nowhere, stood what can only be called a city of rocks. 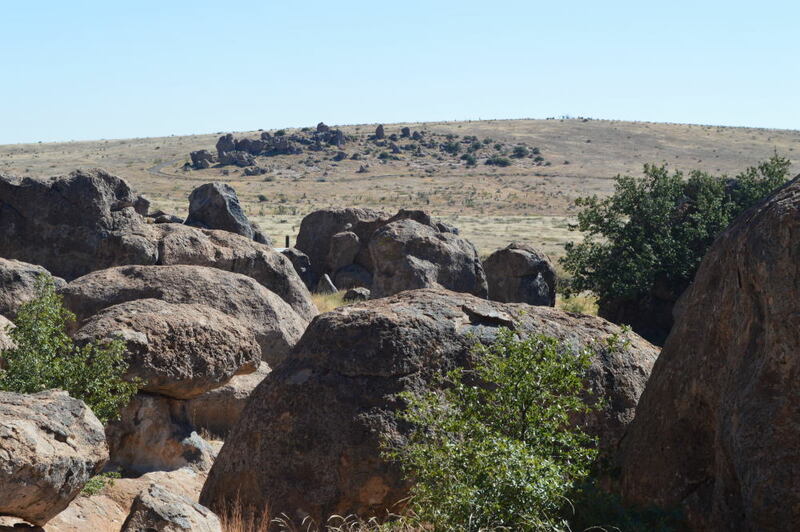 They are a jumbled mass of very large boulders in an otherwise flat desert-like area. In addition to the rocks and some fantastic camping spots, the park is known for its stargazing parties. We were there during the day, however, so we stuck to exploring and climbing up and around the rocks. I could see how this place would be an absolute ideal place to explore with older kids who could spend hours (or maybe days) just climbing all over the rocks. 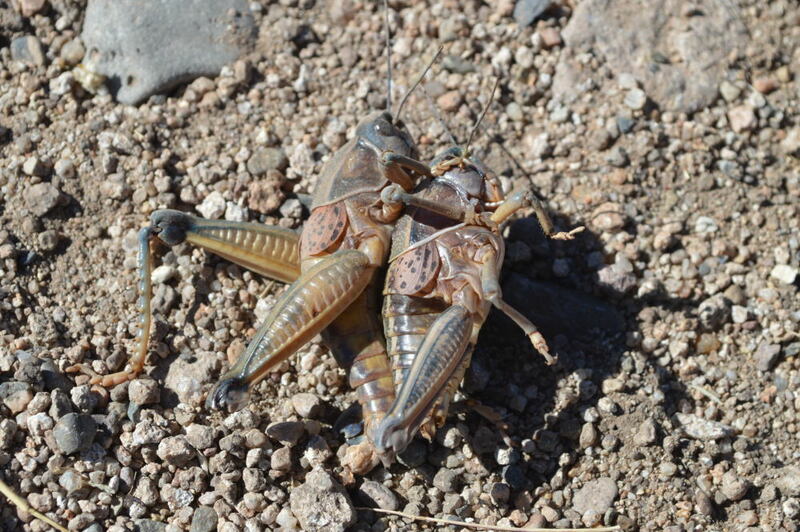 Though we enjoyed the rocks, the mighty large grasshoppers were quite the draw. 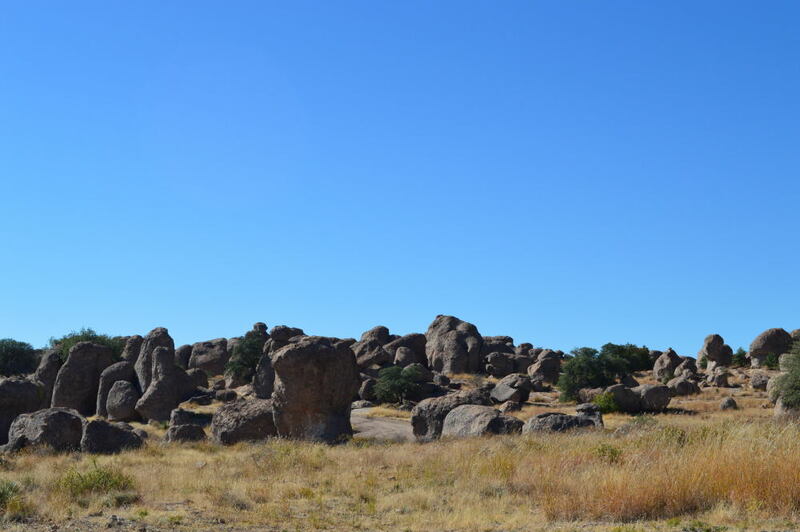 Enjoy a few final photos of our time in City of Rocks and the views of the beautiful New Mexico horizon. We spent a warm and sunny week in Arizona in early November, relishing the last days of wearing shorts and the last nights of sitting outside under the stars reading without shivering and diving into our sleeping bags as soon as the sun went down. We spent the first couple of nights at a very nice (and very inexpensive) hotel in Phoenix while we ran errands. 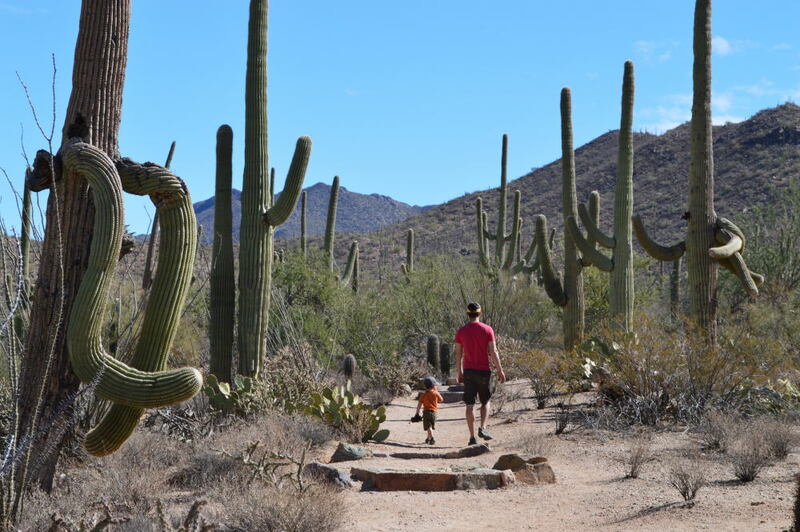 We continued south to Tuscon, and spent the rest of our week camping in Tuscon Mountain Park just west of the city. Our first night of camping was less than ideal. I wouldn’t call it our worst night of camping (that was the night of the never-ending trains just south of Bellingham, Washington), but it was a close second. The setting was picturesque, but our neighbors were less than ideal. To one side of us was a couple that believed they could only communicate by shouting. Their shouts continued into the night and were only drowned out by the deafening sounds of a concert celebrating the Day of the Dead. It seemed like we were off in the wilderness when we set up camp. We weren’t. Though it was out of sight, our tent was not too far from an old-west theme park, complete with live (and loud) entertainment. When the music finally stopped a couple of hours past midnight, we thought we could finally catch a few zzzzs before daybreak. Hahaha! Shortly after the music stopped, our tent was illuminated by headlights from the cars of concert-goers as they parked, partied, and then crashed for the night in the site on the other side of us. Alan awoke to one man asleep on the ground, whiskey bottle to one side, Budweiser cans on the other side. Watching them awake one-by-one made me so happy that it has been a very long while since I’ve drunk enough to earn a morning hangover. The second, third, and fourth nights were better, but no less interesting. Once all of our neighbors cleared out, new ones moved in. Replacing the drunk and passed out concertgoers was an older man and his dog. They had no car, no bike, and did not appear to have a backpack. They never left the site for the three remaining days we were there, and we’re still not sure how they arrived. There was a bit of muttering and full-on conversations with the dog, but things got interesting at the first sounds of the coyotes. One coyote started, then a second, a sixth, and a twenty-sixth. And then the older man joined in, howling right along with the coyotes for a few minutes until they all quieted down. Alan and I looked at each other, whispering that we were in for a long night. Though our human neighbors changed, one thing that did not change was the very regular sounds of coyotes near (sometimes very near) and far. Luckily for us, our neighbor did not choose to join in every chorus of the canines. Phew! Sleep was much better during the rest of our stay. When we weren’t listening to neighbors, concerts, or coyotes, we were out enjoying the desert and the tree-like cacti that dotted the landscape. 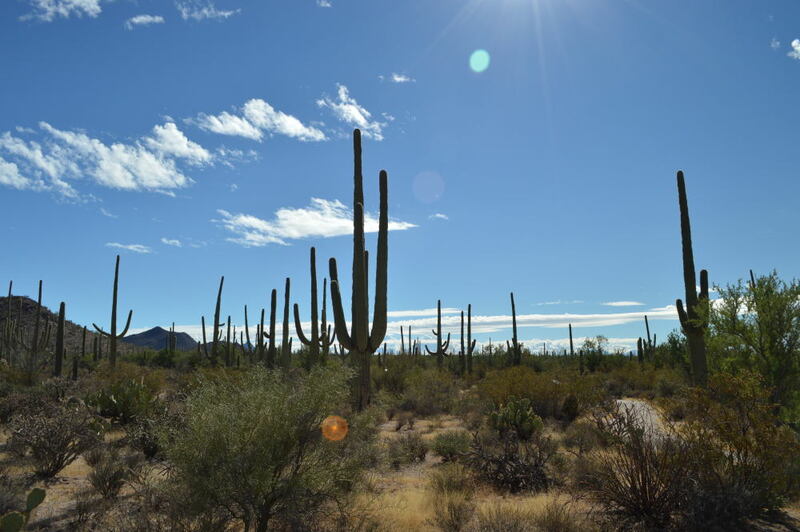 We went to both the western and eastern sections of Saguaro National Park (pronounced Sawaro) and both prefered the landscapes and the hiking trails of the western half of the park. The eastern portion is more easily accessible from the city, which also means that large portions of it have wide views of the urban area. The western portion is set further off from the city and gives you the feel of being in a more isolated locale. Regardless, the cacti, and particularly the Saguaro, were fascinating. I always thought of cacti as something apart from other plants, but as I get to know cacti better during this trip, I begin to see the many similarities. 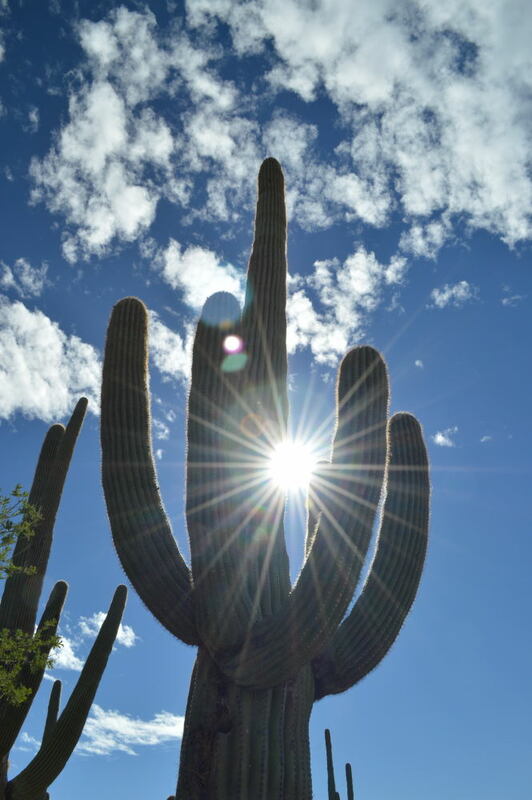 Saguaros are very much like a tree, from their height and girth to their woody stems. 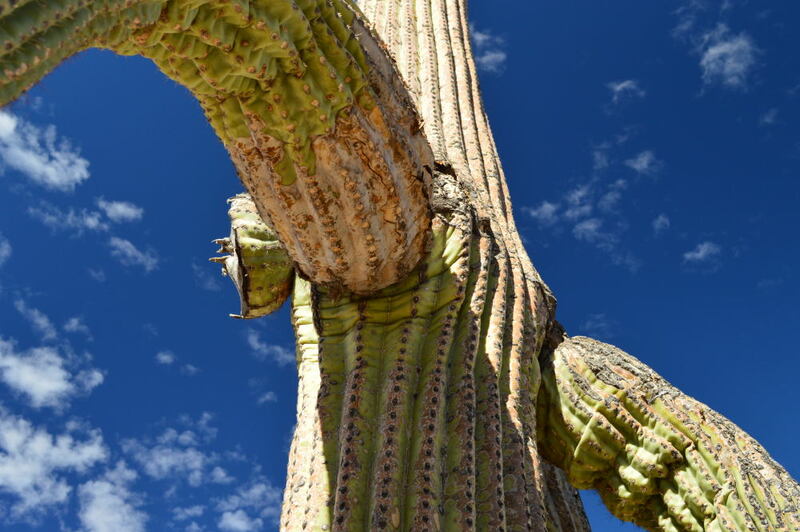 The decaying Saguaro allowed us to see the similarities most closely. 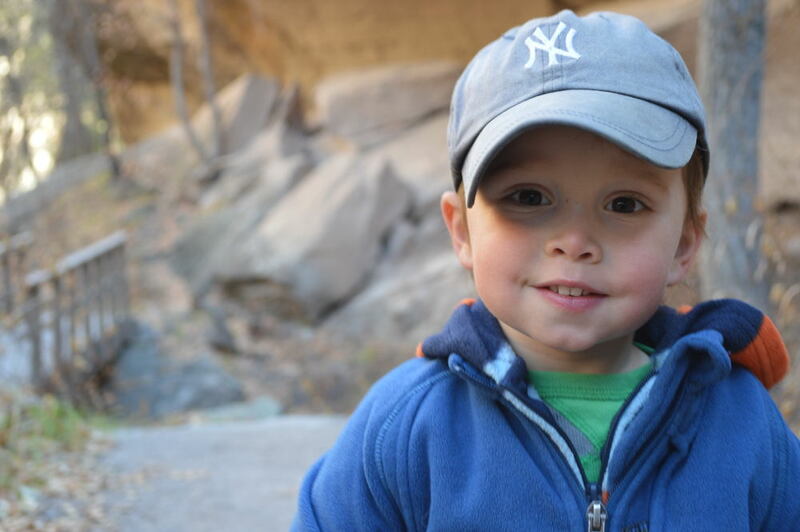 We spent our time hiking, taking photographs, and helping Van earn his fourth Junior Ranger badge. In between our forays into the desert, we spent a morning at the International Wildlife Museum, run by Safari Club International. As one might expect, there were many taxidermied animals – big game and small game – as well as a stunning collection of butterflies, moths, beetles, and other insects. The exhibits were very well done and, except for a cavernous trophy room (which was interesting and educational in its own right), were focused on wildlife conservation. They even had a display on famous hunter/conservationists, including none other than Aldo Leopold, and a quote from an author and individual I greatly admire, Wendell Berry. Though we spent most of our time in the Tuscon area exploring its natural wonders, we did make time for a few man-made wonders. The highlight was our visit to Mission San Xavier del Back, which was constructed in the late 1700s. It’s hard to overstate the magnificence of the bright white walls against the deep, blue, afternoon sky. But most of all, our week in Arizona will bring back memories of late night howls and the tree like cacti recoiling from any attempt at an embrace. Ever since I was a kid, I’ve wanted to visit Joshua Tree National Park. The name always conjured up images of a strange desert landscape full of alien trees transplanted by fairytale characters. Naturally, I had high expectations. They were blown out of the water! This park was incredible for so many reasons that have nothing to do with the fantastical plant that gives the park its name. 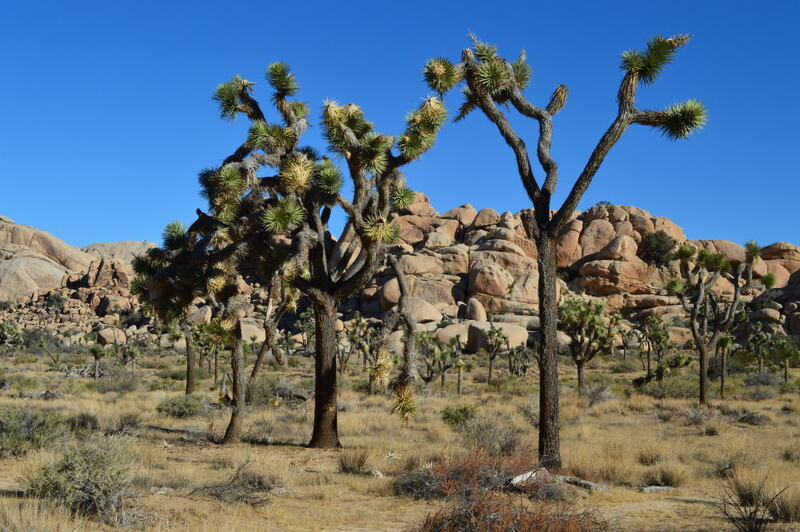 Although seeing forests of Joshua Trees is reason enough to visit this southern California park. We visited at a great time of year – the very end of October (yes, that means I’m a month behind on my posts). The weather was warm enough during the day that light fleeces were all that was needed, except when they were tied around our waists while we were hiking. As soon as the sun went down, it got cold. It was in the low thirties at night, so we didn’t spend a lot of time out of our tent in the evening hours. But, when we did spend some time in the cold night air, we were rewarded with the most brilliant sky I’ve seen on this trip. We’ve been camping for eight months. Without a doubt, Joshua Tree takes the prize for the most brilliant stars and inky skies we’ve seen. It was not lost on me that the lack of moonlight added to this effect. Like the Joshua Trees themselves, the night sky is reason enough to visit. We expected to have our choice of campsites, given that the park has a generous number of sites and we were visiting in the middle of the week in the middle of the school year. We were wrong! Yes, there were plenty of spots from which we could choose, but many of the sites were already taken. Some of the spots were filled with retired travelers, a few with families who appeared to be on long-term pilgrimages like us, but most of the campers were rock climbers. Had I known more about the camel-colored rock formations pushing up from the desert floor like large drops of liquid not subject to gravity, this would not have been a surprise. We set out to find a campsite that would protect us from the 60+ mile an hour winds that were predicted at night and found a site where we could set up our tent in a crevice between rocks and shrubs. The wind may have howled, but we were snug and warmish all night long. Alan’s ankle was beginning to feel better, so we were able to go on a number of small nature trails and a few proper hikes. 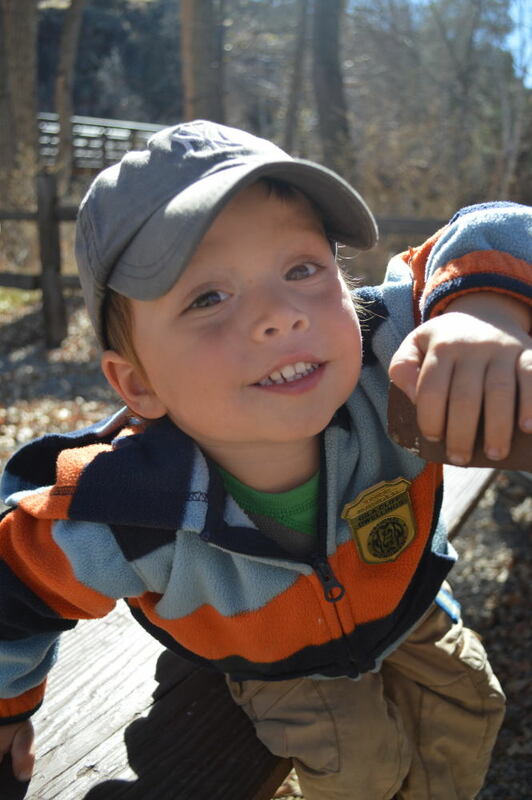 Van loves the nature trails, mainly because he loves running from sign to sign or number to number. He was a little boy in heaven. My favorite of the nature trails was our amble through the Cholla Cactus Garden. The garden is situated in a part of the park where the Colorado Desert meets the higher, Mojave Desert. There are many types of Cholla Cacti throughout the southwest, but these particular Cholla, the Teddy Bear Cholla, get their name for obvious reasons. Just don’t cuddle them, or even get close to them. If you brush against one with the slightest amount of skin or clothing, spines will jump off the plant and on to you. 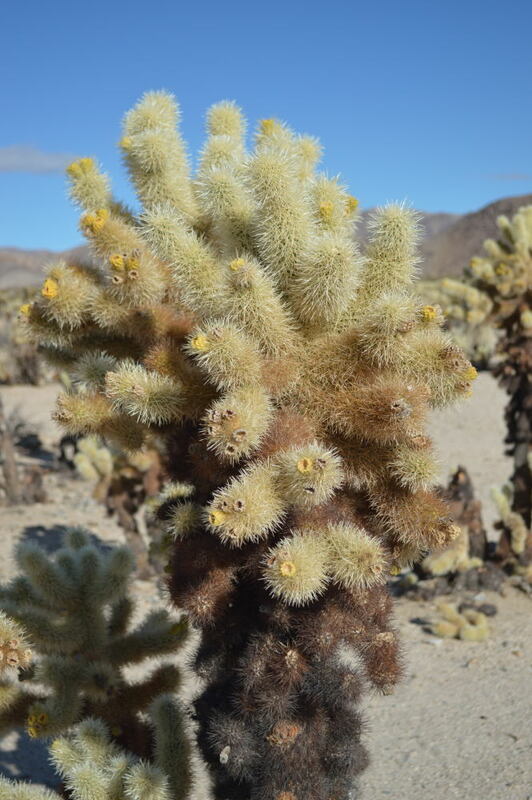 This gives the cute but unfriendly plant its nickname, Jumping Cholla. This was a case of making sure that our little Junior Ranger really stayed on trail. Thankfully that’s the one rule about hiking in sensitive habitat that Van has really embraced. 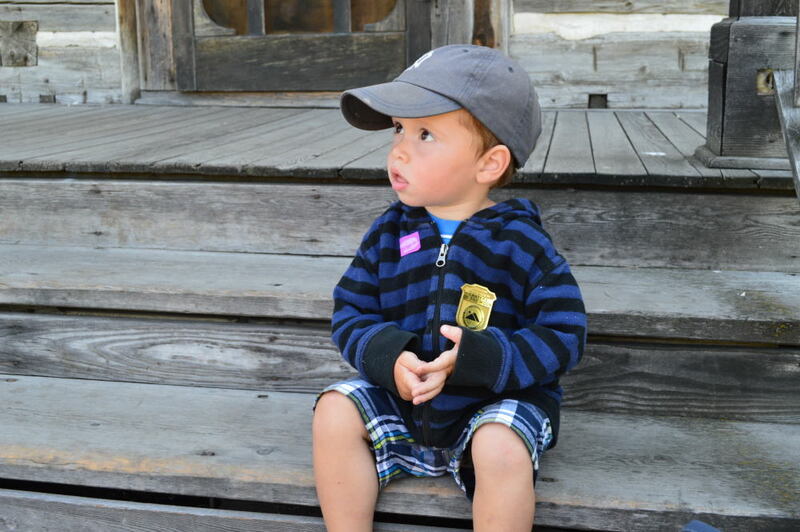 Especially since he was working on obtaining yet another Junior Ranger badge. We also took several hikes and nature walks through the Joshua Tree forests, in and around the magnificent rock formations, to see a small dam (a remnant from when this area received twice as much rain just a short century ago), and to see hypercolor Disneyified petroglyphs. Shocking to think that this area, which receives so little rain, received twice as much a mere century ago. It makes me wonder what this area will look like in another century, after climate change has an even more significant impact on the temperatures and rainfall in this area. The most fascinating hike we took was to 49 Palms Oasis. We hiked up and over a ridge through a dry desert landscape dotted with barrel cacti. As we headed down into a valley, in the distance was a striking site. A small cluster of green. Palm trees in the middle of the desert! Yes, I’ve seen plenty of palm trees in the middle of the desert before. Typically in straight lines along streets, golf courses, and resorts. But to see a natural palm oasis was something else. What appeared to be a tiny cluster was actually quite large once we were hiking amongst the palms. 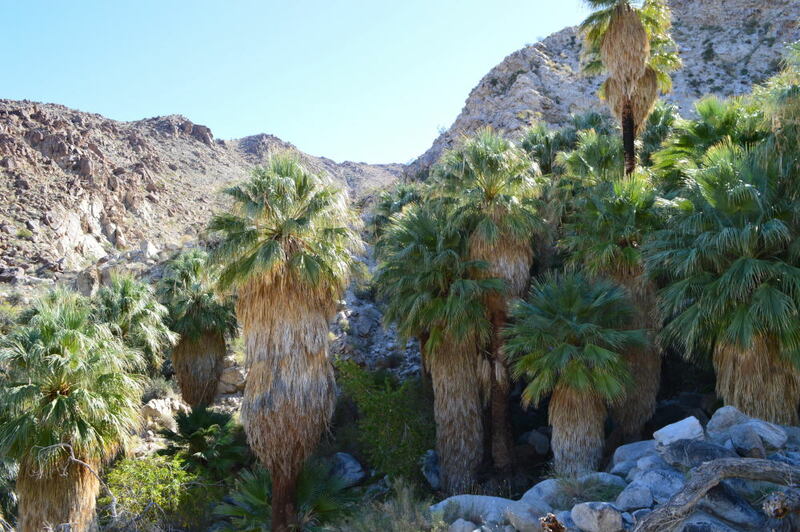 I can imagine how hikers in the hot summer must feel such relief in the shade of the fan palms. 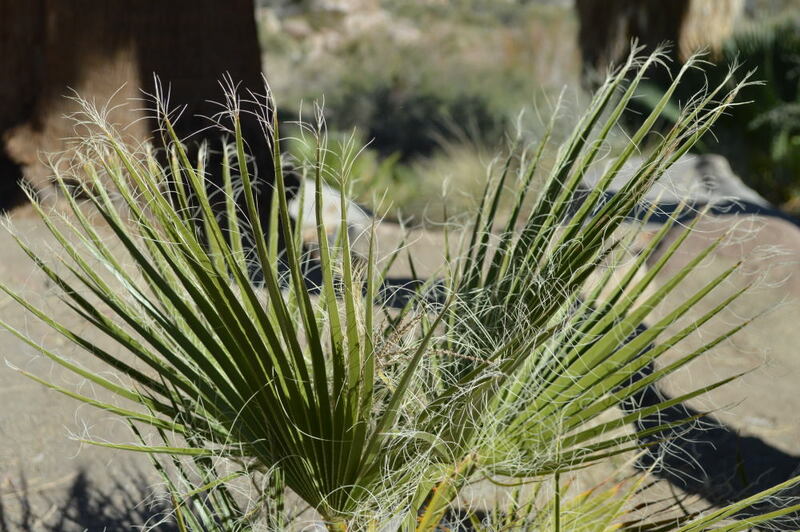 And so I repeat myself, hiking to a true palm oasis is reason enough to come to Joshua Tree National Park. My biggest lesson from visiting Joshua Tree is that the layperson’s view that a desert is devoid of life is categorically untrue. 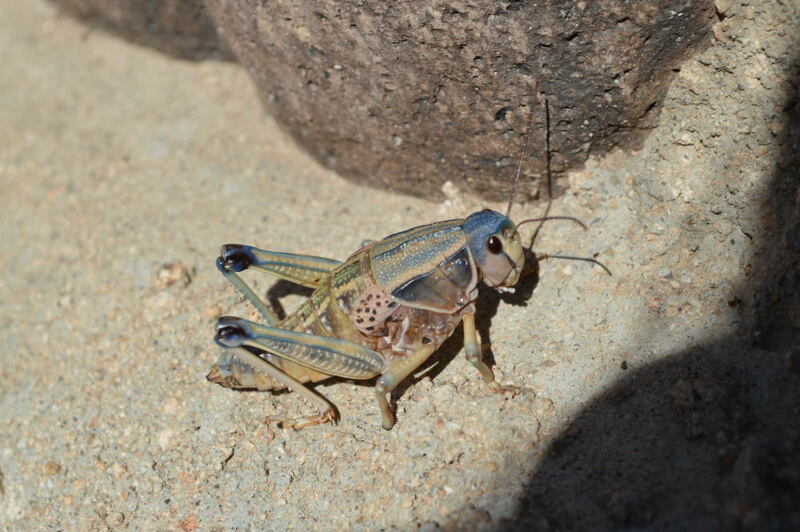 Joshua Tree is an incredibly diverse biological environment. Many of the plants were new to me, and I had such a blast learning about the myriad of plants we were living, hiking, and eating around and what each plant did to conserve water and thrive in this environment. More surprising to me was the richness of color found in the plants. I expected that the plants would mimic the colors of the rock and soil. 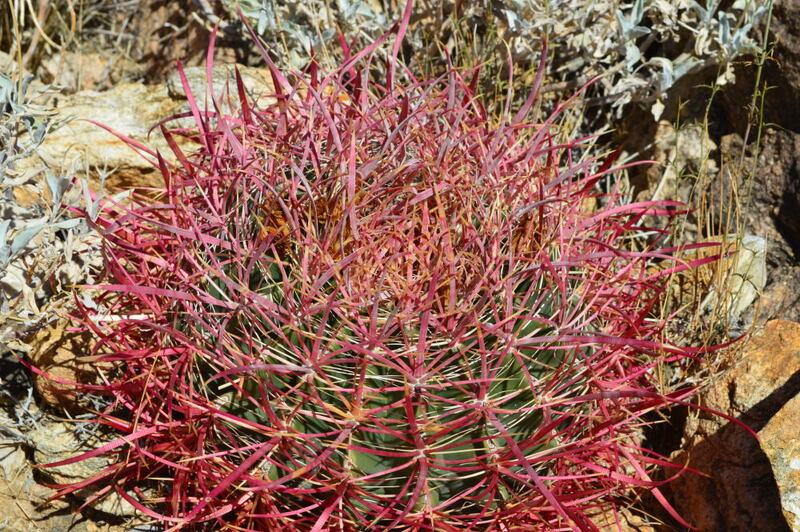 Instead, many of these plants stood out for their saturated colors against the tans and browns of the desert floor. Our last day in the park coincided with Halloween. 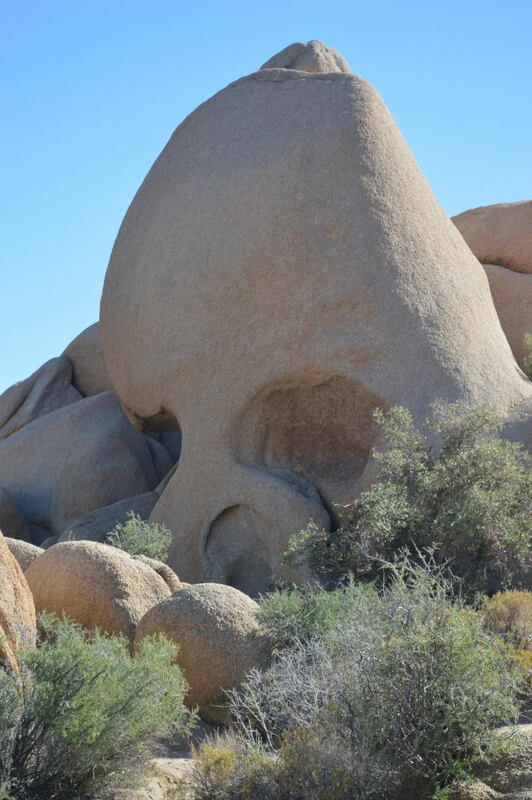 We were not about to go trick or treating in the campground, so instead we celebrated by taking Van to Skull Rock. Aptly named, indeed! Given the government shut-down, this was the first national park we had visited since the Pacific Northwest. It was great to spend a few solid days in the outdoors – no traffic, smog, or crowds. 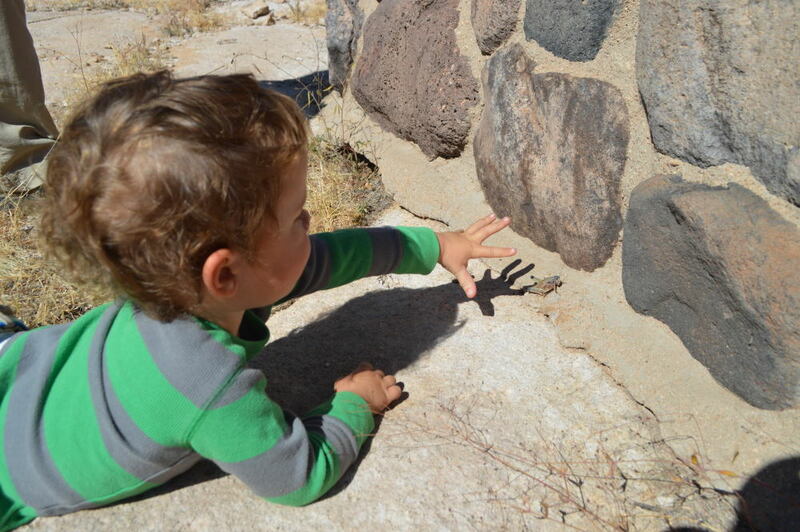 And since Van is growing up before our very eyes, he’s finally at the age that he can participate in the Junior Ranger activities with more understanding. 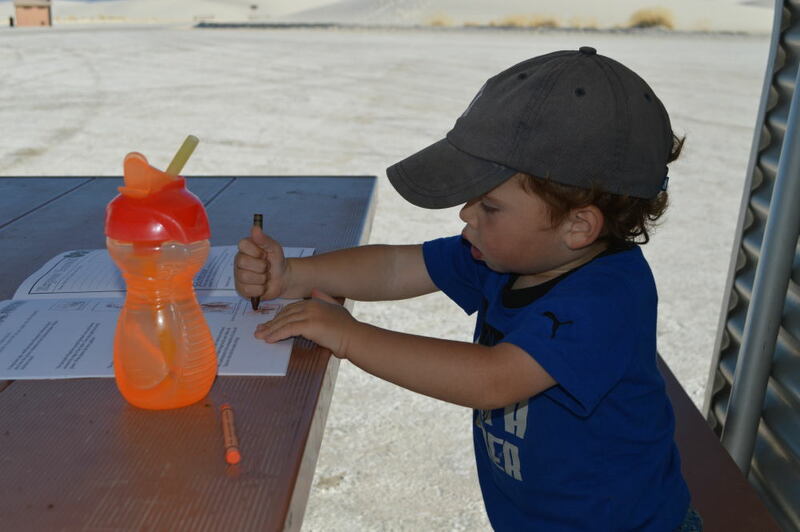 Although he had received two junior rangers badges at previous parks, this was the first park where he completed the activity booklet in order to earn a badge, bragging rights, and a fabulous book that he continues to read about Lilly the Joshua Tree. The rangers were incredibly supportive and friendly with Van, which just added to how much we enjoyed Joshua Tree. If you’re traveling to Southern California, spending a few nights camping and exploring this park should be very high on your agenda. Aside from seeing friends, Joshua Tree was my clear favorite during our time in California.